A simple thumb rule to keep in mind is to eat a rainbow of colorful foods (naturally-colored that is). For example, food that contains antioxidants can help you in avoiding age-related macular degeneration or in the worst case scenario, blindness. Include fruits and vegetables like peaches, papaya, mango, carrots, pumpkin and apricots that are orange/yellow in color as they are loaded with beta-carotene, which helps the body to convert into vitamin A- the essential nutrient that fights major eye diseases like glaucoma, cataract, and night blindness. Vitamin A rich foods also include broccoli, sweet potatoes, and spinach. The other vitamin that is crucial for good vision is Vitamin C. It can, for example, help to prevent cataract. Good sources for this are citrus fruits, and various berries. Omega 3 fatty acids are also of importance for healthy vision and it can be found in salmon, mackerel, flaxseed, and walnuts. 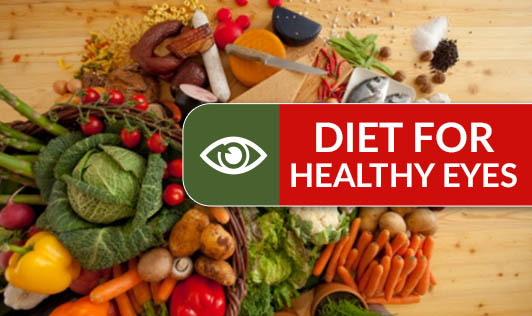 Science Daily (Feb. 18, 2009) - University of Liverpool scientists claim that the degeneration of sight, caused by a common eye disease, could be reduced by up to 20% by increasing the amount of fruit, vegetables and nuts in the diet. Age-related Macular Degeneration (AMD) is the leading cause of blindness in the UK, with 45% of those registered as blind suffering from the disease. The condition results in a gradual loss of central vision, due to the failure of cells in the macular - the light sensitive membrane at the centre of the retina. There is currently no cure for the more common ‘dry' form of the disease, which is suffered by 90% of AMD patients. Professor Ian Grierson, Head of Ophthalmology at the University, has produced a comprehensive cooking guide called ‘Fruit for Vision', designed to add fruit and vegetables into everyday meals. The recipes will help AMD sufferers slow down the degeneration process by increasing micronutrient, vitamin and antioxidant intake in the diet. Professor Grierson said: "Poor eating habits have a huge impact on health in general and the health of your eyes is no exception. There are of course other risk factors related to AMD such as age, light exposure, smoking and being overweight. But if we can improve the kind of food that we eat, we could dramatically reduce the number of people who may suffer from eye diseases in the future." Most often it is a hereditary trait. Circles under the eyes can worsen in people who smoke or suffer from allergies. It may also be due to the way we sleep - horizontally. Fluid accumulates and veins dilate making the lower lids look quite dark and puffy.